I really love makeup and getting dressed up and doing my hair. But during the summer, ain't nobody got the time fo dat (but mostly not the energy). Especially when I'm not going anywhere exciting, mostly just to babysit or running errands, I don't put much time into my makeup or hair, and I'm kind of loving it. And when I told my brother, Brandon, that I needed him to take photos (like he normally does, being a sweet brother) and he saw me like this, he turned his nose up and went, "That's it?" Because yes, Brandon, sometimes you gotta have a casual outfit on for a casual makeup and hair look. After I wash my face, I use Olay face cream, and my mom and I have always worshiped that stuff (but check out Sarah's post for her top 5 moisturizers!). 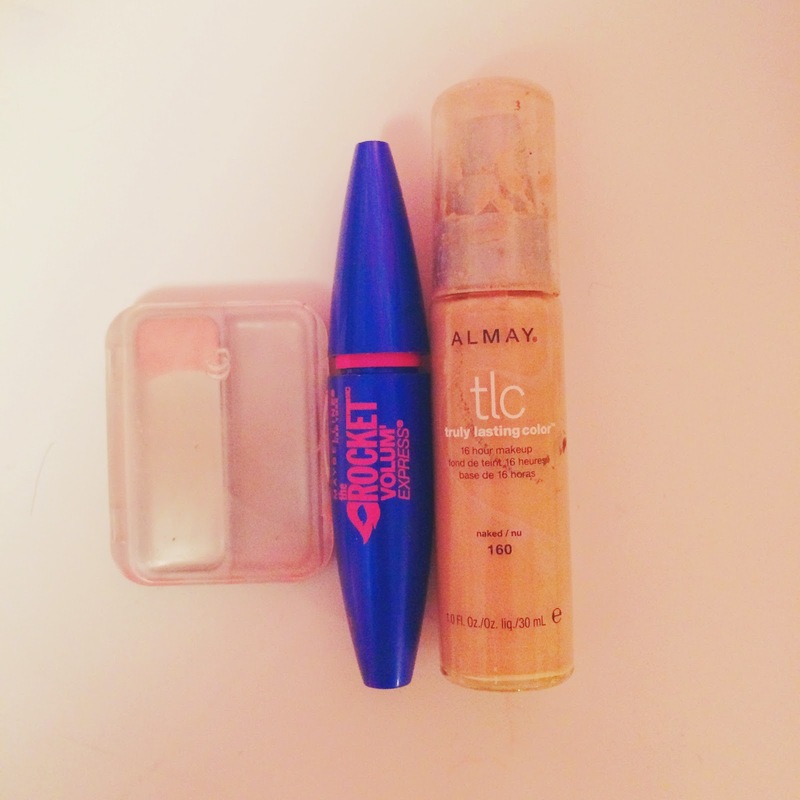 Then I use Almay foundation, which I fell in love with after I realized that the other drugstore foundations were making my skin break out. I use a little bit of blush, nothing fancy, just CoverGirl, and then I really love this mascara (Maybelline Rocket Volume Express). I love big, long eyelashes, and I bought this on a whim, but I'm obsessed. It goes right to the bottom of my eyelashes, making them look longer than they are, and I stick it on my bottom lashes, too! Then... confession time: I love driving with my windows down in the summertime, but really, who doesn't? I like the wind in my face and especially in my hair, because it acts as a hair dryer. I'm not kidding, I couldn't ever leave my house in the winter with wet hair (first of all- tacky, second of all- freezing), but every time I get in the car with wet hair, I roll my windows down and it dries so quickly. Much better than the heat from a blow dryer, and I like my hair wavy! And now that I've stopped wearing so much makeup, it feels so special to wear eyeliner (my bae), and it's so cleansing to not have much makeup on my face! What kind of makeup do you wear during the summer? And of course, I loooved that post!! The Almay doesn't make you break out? I'll have to look into it! What other foundations did you find were making you break out before switching? These are my favorite blog pictures yet!